Amongst the many stylish sister duos that Bollywood can boast about, Kareena Kapoor and Karisma Kapoor are undoubtedly right on top. Kareena and Karisma Kapoor have a natural flair and panache that few can compete with. These Kapoor sisters might have been around longer than most people in the business, but their sense of style and approach to fashion seems far from jaded. Kareena is deemed as one of the most sought after and reputed female actors in Bollywood, currently. Karisma may not be acting in films any longer (or at the moment), but this 90s’ superstar is always in the limelight and seems to have lost little or no relevance at all. Together, these sisters prove to be quiet the powerhouse of talent and sartorial choices that are hard to miss. Especially when they’re walking in and out of airports together. Kareena and Karisma seldom seem to travel without each other. Whether it’s a family holiday or a vacation with friends, they’re both definitely on each other’s lists. Recently, Kareena and Karisma took a holiday to Dubai with their girl gang. They were spotted at Mumbai airport as they landed back from their quick trip abroad. 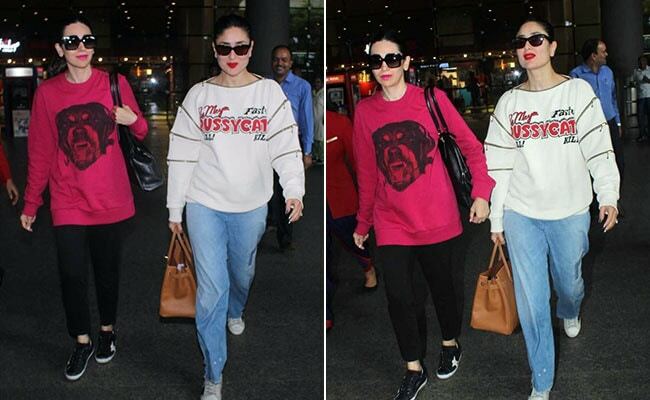 Both Kareena and Karisma chose to wear graphic t-shirts for their flight back. Kareena chose to wear a white slogan t-shirt with zip details on the sleeve and a pair of jeans. She teamed her outfit with a tan bag and a pair of white sneakers. Karisma on the other hand wore a red printed sweatshirt with a pair of black tights and sneakers. Hard to miss were both their bright lipsticks and dark sunglasses. This is what we can safely call a dynamic duo. A few days earlier, while on their way to Dubai with the rest of their gang, Kareena and Karisma dressed equally impressively, if not more. In a picture shared by Karisma just before their departure, we can see Kareena wearing a pair of jeans with a plain tee and a black blazer on top. Karisma chose to wear a slightly more comfortable outfit – a pair of black jogger pants, a white t-shirt and a denim jacket on top. Both the sisters chose to carry and wear the same bags and sneakers as on their way back. Also accompanying them on their trip was their close friend and actor Amrita Arora, makeup artist Mallika Bhat and Kareena’s manager, Poonam Damania. The five seem to have enjoyed a rather stylish evening while in Dubai. Is there any debating that Kareena and Karisma are Bollywood’s most stylish sisters? After looking at their airport style, we think not.